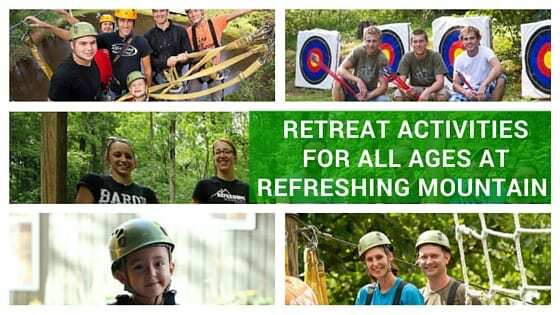 Want to make sure that your group is engaged, having fun and making memories to remember on this years retreat? Good organization, clear purpose, and an incredible location solidifies the connection among team members and successfully moves the group forward to achieve goals during group retreats. As a Christian retreat center located in the Lancaster, Pennsylvania area, we have the location and tools available to help you plan effective and meaningful group retreats. Founded in 1983 by Marlin and Sharon Harnish, we originally started out as a business that could be run together as a family. We purchased the Circle T Ranch which had no plumbing and was overgrown. Actually, it was a bit of a “run down” horse camp with two bunk houses and a stable! Thirty years later, the 80 acre adventure center, and retreat is a destination which features lodgings and meals for group retreats and families and a robust list of exciting activities for all. We are located 25 minutes north of Lancaster, Pennsylvania on beautifully wooded land and are members of the Better Business Bureau and Christian Camp & Conference Associations. The fun and challenge only begins with this list. Nature programs, team scavenger hunts, farm animal experiences, and horse cart rides can be added to your visit. If you choose to stay late or overnight, enjoy a campfire when the sun goes down. If you’re drawing a blank while planning activities designed to build relationships and foster teamwork, the staff at Refreshing Mountain can help. Organized team building challenges are available and can be customized for group retreats. The fun and meaningful challenges will interactively help groups learn to work together. Pulling all the elements together to create perfect group retreats can be time consuming and an sometimes frustrating. If you choose Refreshing Mountain for your retreat location, we take care of the details so that you can just sit back and enjoy your event. The Refreshing Mountain staff has the established processes and expertise to handle groups of all sizes. Retreat Packages include: three different types of lodging, hot buffet meals, meeting rooms with wireless audio visual equipment for rental, on-site activities, and recreation facilities. Group discounts are available and you can find out more about retreats by going to the following website: https://refreshingmountain.com/retreats/faqs/. Other helpful areas on our website are the virtual tour and map; the individual pages describing activities; and detailed information about group scheduling retreats. Reviews, photos, and up to date information about events and activities can be found on our Facebook page: https://www.facebook.com/RefreshingMountain/. Group retreats can get your retreat participants out of the daily grind and provide a boost from “Status Quo” to “Gung Ho”!